WHO: Her Campus, the #1 online community for stylish, savvy and socially over-indexing college women has teamed up with U by Kotex to celebrate College Fashion Week across the United States. This high-impact show features styled designs modeled by actual students, featuring unique looks that define their vision in the classroom, the gym, for the weekend and in formal attire. 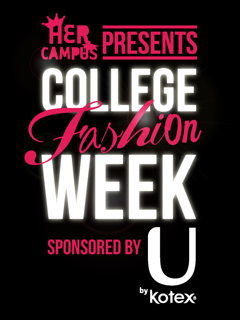 WHY: Don’t miss this truly buzz-worthy event featuring Her Campus models strutting the latest in collegiette fashion. These are the most chic ways to head to class, or out on the town, on a budget, showcased by motivated, intelligent and stylish local students. 0 Response to "College Fashion Week Hits Boston - 9/29"